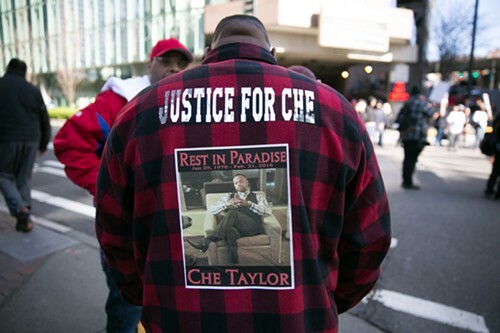 In a demonstration led by Andre Taylor, the brother of Che Taylor, activists gathered across the street from the Seattle Police Department headquarters this morning demanding answers and justice. Activists and family members spoke to the crowd as several SPD officers looked on from across the street. 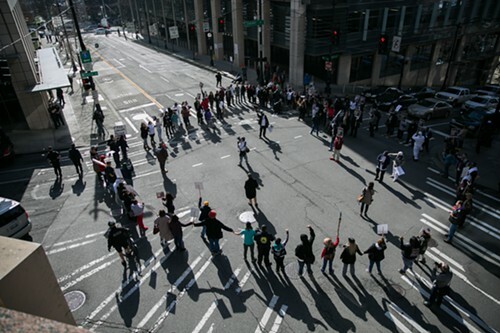 The thumping rotors of a news helicopter reverberated throughout downtown as the demonstration moved from the sidewalk to the street, blocking off the intersection at 5th and Cherry before marching through city streets to the US District Court at 7th and Stewart. Che's mother expressed through her tears her determination to see this to the end. "I'll be here to the end, broke or whatever, I'll be here... I know what he would do for me, he would stand for me, and I'm standing to the end." She also talked the crowd about her years of teaching Che how to act around the police. "We practiced this... don't reach for your wallet, get out with your hands up. Do we look stupid?!" Che's wife, Brenda Taylor, talked about her life with Che and the work they did for prison reform. "Most of my marriage my husband was in prison... I worked hard on my husband, we made changes in the prison system... I'm going to continue to see change takes place among our black people." In addition to Che's mother, his wife and brother spoke at length to the crowd. Friends called for support of the family; the family asked for answers and an end to the violence. 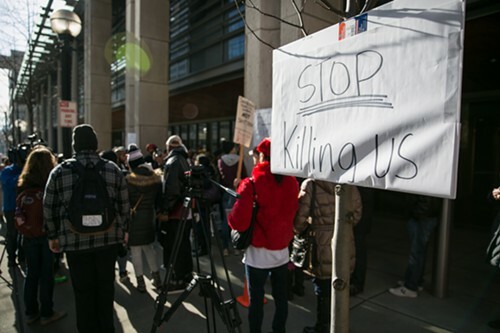 Activists cited statistics about violence against black men at the hands of police, but also called for leadership from young black men to help prevent this from happening to their children. 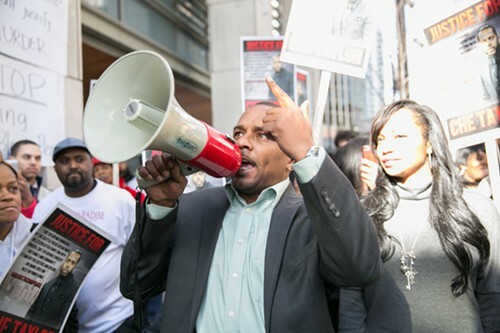 Gerald Hankerson, president of the Seattle King County NAACP, responded to the shooting with anger and exhaustion. A list of demands was read by the activists in regards to actions they believe need to be taken by the Seattle Police Department. Those demands include firing police chief Kathleen O'Toole. 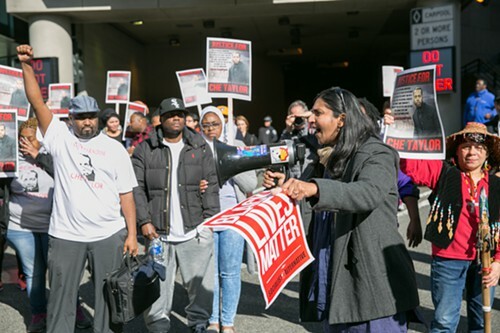 Seattle City Council member Kshama Sawant also joined the demonstration for a brief time and spoke with the crowd. 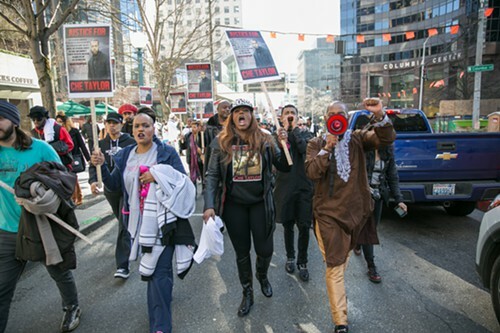 Sawant said, "First of all, we have to work on the specific demands to bring justice to Che Taylor, and if the [police] chief and other leaders in the police department are incapable or unwilling to facilitate that process and show genuine leadership at this moment, where we know there's systematic racial injustice and profiling by the police, then yes, we will need to hold all—not just the police department, but we need to hold elected officials accountable. 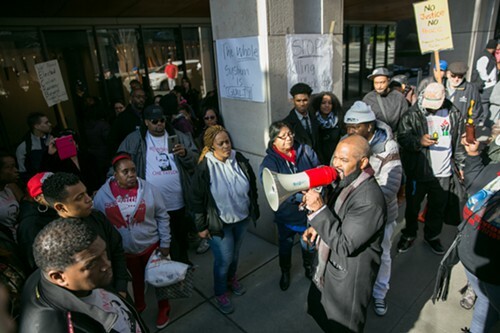 Ultimately, the buck stops at City Hall." It wasn't clear whether she was saying she believes O'Toole should be fired. But she did say, "The police department reports to the mayors office and the city council. We need to make sure that we hold the political leadership accountable. One of the things we need to move towards and use this energy to build towards real community accountability [is] community oversight. That's been a demand of the Black Lives Matter movement all along. We need to hold all these people accountable and then it's their choice, whether they want to stand on the right side of history, or the wrong side of history."